Finland’s mighty Turisas has made impressive stylistic strides in the span of just three studio albums. On Battle Metal and The Varangian Way, they already established themselves as a very versatile band, mixing the anthemic qualities of traditional heavy metal with folksy instrumentation (such as violins and accordions) and an ambition towards classical music with the use of choirs and orchestral samples. On Stand Up And Fight, the latter element is taken up several notches to even more grandiose heights. Their use of live string and horn sections (and a classical choir to boot) brings some well-used muscle, pushing the epicness of the soundscape to full-blown cinematic levels. I’ll go on a limb and say that if film score-masters like James Horner or John Williams were metal fans, they would gleefully throw up the horns (the hand moreso than the brass ones) listening to this record. The lyrical themes revolve around historical times of heroic exploration, bloody warfare, grand naval theft and the crumbling of empires. What really appeals to me with these guys is that although their lyrical material is every bit as imposing and pompous as the music, there’s a very evident tongue-in-cheek quality to them. They’re undoubtedly doing their thing with full force, but not too seriously. A relaxed vibe of martial fun abounds. Singer Mathias “Warlord” Nygård does a fine job at the helm with the microphone, growling and gruffing his way through most of the aggressive storming but also handling the subtle croons very commendably. 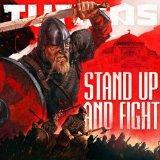 Turisas knows how to handle dynamics so the album isn’t a full-scale assault of blasting at 11, mind you. But don’t worry, metalheads. If the kind of galloping riffage that is offered on Take The Day! or Hunting Pirates doesn’t throw you into the pit, it’s not the music’s fault. Feel how your crimson-covered swords are lifted into the wind when hearing the stomp of The March Of The Varangian Guard. Marvel at the prog rock wackyness (seriously, during a few select seconds I am even getting some Mr. Bungle-vibes) of The Great Escape. Brood with the darker tones of Fear The Fear. Stand strong, mouths agape as the choir reaches downright operatic levels of pomp on End Of An Empire. Just brilliant stuff throughout. Based on interviews I read prior to this album’s release, the four years it took to get here from The Varangian Way was a gruelling and expensive period, but I’m glad the band took the time to fully flesh out the gargantuan visions of sound that are now out for all to hear on Stand Up And Fight. I could see this being too pompous and symphonic for some, but I love it. The best album of Turisas’ career, which only leaves one wondering if they’re able to top this without drastically changing their musical direction. Until then, stand up and indeed, fight!